You can say that Bernadette Castro is a double-alumni of the University of Florida. She received her bachelor’s degree in broadcast journalism from the College of Journalism and Communications in 1966 and came back to earn her M.Ed. in education leadership in 1978. Still, there are those who might remember her as a 4-year-old girl featured on commercials in the early days of television, opening sofa beds (“so easy, a child could do it”) promoting her father’s business, Castro Convertibles. Before the passing of her father, Bernard, in 1991, Castro helped run the company he founded by utilizing her marketing and advertising skills. Today, she continues to be involved in her family’s business, which evolved into real estate. 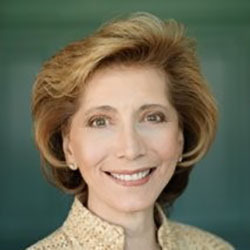 She currently holds a position in the business as chairman at Castro Properties, with buildings in New York, Connecticut, Virginia and Florida, according to her LinkedIn profile. She’s also worked in government in New York, where she currently lives. She served three terms as a commissioner for the New York State Office of Parks, Recreation & Historic Preservation. She was also appointed vice chair of the advisory council for Historic Preservation based out of Washington, D.C. by former President George W. Bush. Castro has also served on several charitable and not-for-profit organizations, including the Interfaith Nutrition Network (The INN), Tomorrow’s Hope Foundation, the New York Landmarks Conservancy, the Volunteers for Wildlife and the Royal Dames for Cancer Research.